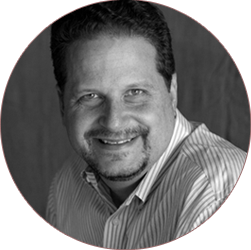 …the above insights, and others like them, are great advice from practitioners of the Lean methodology. They hammer into the entrepreneur’s brain the importance of talking directly with customers before and during product development. It’s great advice, but there are gaps: How do we go about understanding the customer’s struggle? What are we looking for when we observe customers? When we talk with customers, what do we talk about and what answers are we trying to pull out of them? 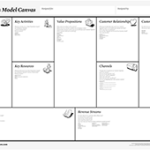 The business model canvas by Alexander Osterwalder and Yves Pigneur. The business model canvas is a great tool; however, by it’s own definition, it’s filled with guesses and hypotheses. How do we quickly eliminate these unknowns in the best way? How do we know if we have enough information to begin building a product? Without knowing how to observe customer behavior, talk with customers, analyze situations and then distill a Job To Be Done, a team will trip into gaps — squandering customer development efforts. When this happens, the product team is at great risk of wasting money and opportunity — often without knowing it. Learn to resist building their product before really understanding the customer’s struggle. Have a strategy that guides them in executing customer development. Know when they have learned enough about their customer’s struggle to begin creating solutions. Be able to quickly and easily communicate this information throughout the team and organization. After years of working with startups and interviewing all kinds of customers, I’ve created a plan to turn the deluge of information that surfaces during customer development into a succinct format which a team and organization can easily absorb and use as a guide for designing products. I call this guide the Job Outline. It’s a high level guide on how to research customers and what to look for. Exists as a succinct artifact which replaces the myriad of documents most organizations create in order to get everyone involved with the product, thinking the same way. 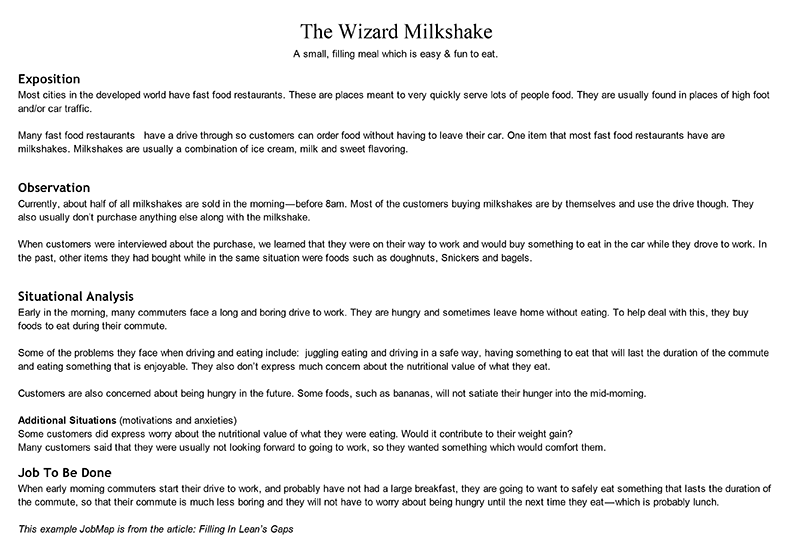 To illustrate what a Job Outline looks like, we’ll use it to describe the classic Jobs To Be Done example of a milkshake’s job. 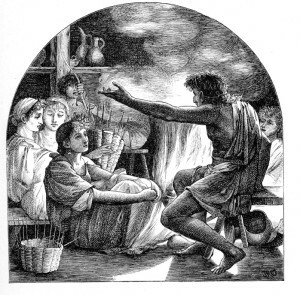 In story telling ( narratives ) it often helps to introduce background information which sets the stage before the main plot begins. Writers do this so the audience can quickly understand the context which everything happens. The same is true for product design. 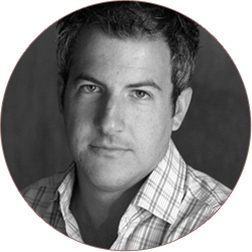 When creating an exposition for a product, consider the dry facts of the situation. Briefly explain the who, what, when and where, but not the why. The goal is to make sure everyone knows the context of the customer’s struggle. Sometimes this information may feel like common knowledge and therefore unnecessary, as we’ll see in the example below. However, there will be times when there is a lot of contextual information which the average person may not know about — such as when creating a product for bankers and lawyers to use for managing company mergers and acquisitions. Most cities in the developed world have fast food restaurants. These are places meant to very quickly serve lots of people food. They are usually found in places of high foot and/or car traffic. Many fast food restaurants have a drive through so customers can order food without having to leave their car. One item that most fast food restaurants have are milkshakes. 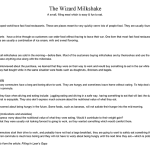 Milkshakes are usually a combination of ice cream, milk and sweet flavoring. The pre-existing behaviors customers do now and have done in the past. The purchases which customers make and have made in the past. One of the greatest insights that comes from the Jobs To Be Done philosophy is that almost every product was & is built upon the customer’s existing idea of how to solve a problem — a behavior they were accustomed to. 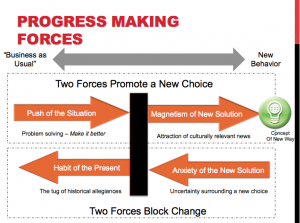 To discover the pre-existing behavior which your product will build upon, begin watching what customers are doing now. It can be visual ( physically watching customers ), technical ( data metics ) and general research. After collecting all this information about what, where, when, customers are consuming, it’s time to use this knowledge and begin interviewing customers. Interviewing customers is where you start to discover the 2nd important part of the Observation stage — the purchases customers have made in the past. How to conduct customer interviews is a massive topic well beyond the scope of this article; however, what will be mentioned here is the need to ask customers about their behavior (which has been observed) and their purchase history whenever they were in this situation before. The key is to understand causality. We have what, where, when, but we need to discover “why” (Push, Pull, Anxiety, Habit). This is still observation mode so this is all about recording, not analysis. Analysis comes later. Currently, about half of all milkshakes are sold in the morning — before 8am. Most of the customers buying milkshakes are by themselves and use the drive though. They also usually don’t purchase anything else along with the milkshake. When customers were interviewed about the purchase, we learned that they were on their way to work and would buy something to eat in the car while they drove to work. In the past, other items they had bought while in the same situation were foods such as doughnuts, Snickers and bagels. To learn more about conducting these types of interviews: See David Wu’s articles and the JTBD interview lessons. 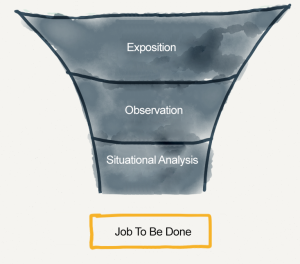 The customer interview lies half in Observation and half in Situational Analysis. The first part of the interview is all about facts, uncovering observations, while another part of the interview is about finding anxieties and motivations. Understanding these anxieties and motivations will be critical in developing an analysis of the customer’s struggle — and eventually creating a solution for this struggle. The customer’s struggle is what the Situational Analysis is all about. This is where they need to make a decision about purchasing or not. Begin the Situational Analysis by explaining the challenges customers’ are facing and what is pulling and pushing them to and from different solutions. Then, describe their anxieties and motivations. Early in the morning, many commuters face a long and boring drive to work. They are hungry and sometimes leave home without eating. To help deal with this, they buy foods to eat during their commute. Some of the problems they face when driving and eating include: juggling eating and driving in a safe way, having something to eat that will last the duration of the commute and eating something that is enjoyable. They also don’t express much concern about the nutritional value of what they eat. Customers are also concerned about being hungry in the future. Some foods, such as bananas, will not satiate their hunger into the mid-morning. 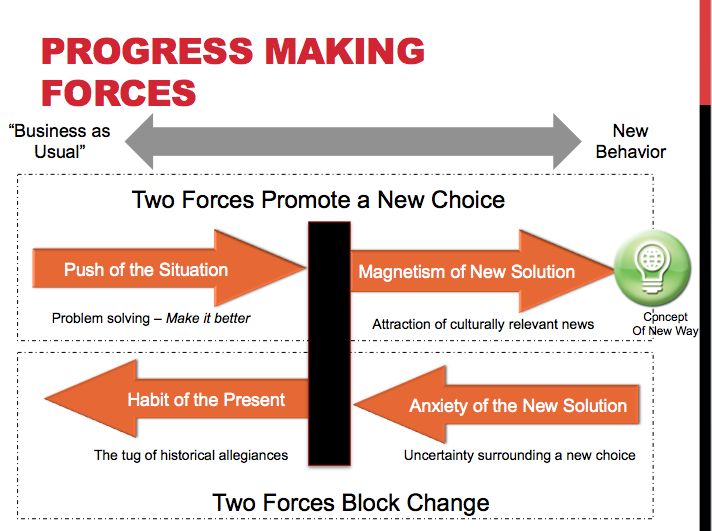 To learn more about customer anxieties, listen to this podcast: Unpacking The Progress Making Forces Diagram. The research and analysis thus far has been 99% of the spear. Now, it’s time to craft the spear’s tip: the Job To Be Done. The Job To Be Done is not a solution, but a way of thinking about what the solution should accomplish. It’s not a shot in the dark hypothesis, but rather the result of deep thinking and a coalescing of research. Here is an example of a Job To Be Done that a milkshake is hired for. When early morning commuters start their drive to work, and probably have not had a large breakfast, they are going to want to safely eat something that lasts the duration of the commute, so that their commute is much less boring and they will not have to worry about being hungry until the next time they eat — which is probably lunch. The situation (long car ride in morning rush hour) combined with the progress that needs to be made (hold me over until lunch time) add up to help us understand causality and what will do the job and what won’t (in: snickers, bagels, milkshakes, out: sandwich, pizza, coke). To effectively design products, product designers have to deeply understand the customer’s struggle. With the Job Outline, product designers now have granule techniques to uncover this struggle and a way to succinctly convey this to their teammates. Download a Job Outline template here. Good post. I have been bringing the JTBD framework into the lean startup space and I’m getting great feedback so far. Hopefully that will also yield better results (work-in-progress). I dig the outline but it appears the “download” at the end was an openly editable google doc, the content has been deleted… fyi. Thanks for the catch Billy! I just uploaded the file as a pdf. Are you familiar with A3 thinking? I’m not, but I’ll look into it. Thanks!